MANSFIELD—On January 28, Methodist Mansfield will celebrate those living a heart-healthy lifestyle and those who’ve survived heart disease. 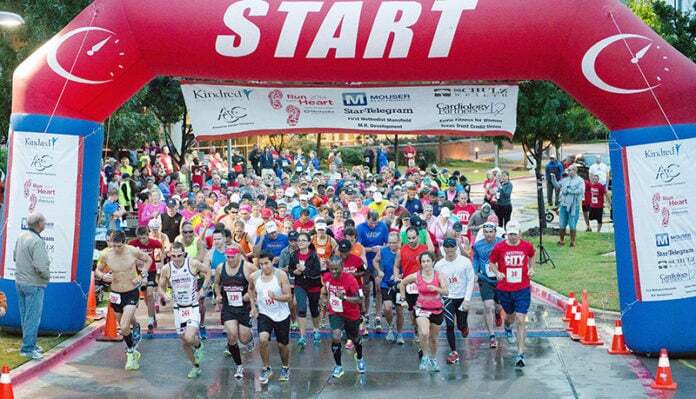 Hundreds of runners from across North Texas will lace up their shoes for a the Run with Heart half marathon, 5K, or one-mile fun run/walk to raise awareness of heart disease prevention. It is also a time to honor those who have lost their battle with heart disease. Runners can choose from a chip-timed half marathon, 5K, or one-mile family fun run/walk. All events for the third annual Run with Heart begin at Methodist Mansfield and travel through the city of Mansfield. Highlights include a heart healthy warm-up provided by Methodist Mansfield’s physical medicine department before the race, and face painting by students of Jack and Jill of America and balloon artist from Timberview High School. After the race, participants will enjoy heart-healthy food, fun music, and an awards ceremony. Everyone is invited to participate, even if you only want to walk or run at your own pace and do not wish to be timed. Volunteers are also needed. Register online at MansfieldRunWithHeart.org. Event proceeds will benefit the Amon G. Carter Foundation Heart and Vascular Center at the hospital and the Tarrant County American Heart Association. Community leaders supporting the event and serving on the steering committee include city of Mansfield Mayor David Cook; Mansfield City Manager Clayton Chandler; Randall Canedy, president of Frost Bank in Mansfield and chairman Methodist Mansfield Community Advisory Board; Sherman Hatch president of Primrose School of Walnut Creek, Michael Klein, director of manufacturing for Klein Tools; John Phillips, President of Methodist Mansfield, Rev. David Alexander, pastor of First United Methodist Church in Mansfield and Methodist Mansfield Community Advisory Board; Rob Schulz, president of Schulz Wealth, Glenn Smith, president and CEO of Mouser Electronics; Michael Van Amburgh, president of Valuation Associates, Inc., and Dr. Jim Vaszauskas, superintendent of Mansfield ISD. Event sponsors include American Carton Company, Cardiology Partners, Kindred Healthcare, Klein Tools, Mouser Electronics. The t-shirt sponsor is Juan Gavalda, MD, and Salvador V. Gavalda. The Finish Zone sponsor is First Methodist Mansfield. The volunteer sponsor is Dallas Renal Group and VAVA Inc. The Water Stop sponsor is Sellmark and Tarrant County College Southeast Campus. Mile sponsors are Arash Manzori, MD Frost Bank, Primrose School of Walnut Creek, Sneha Patel, MD, and Texas Trust Credit Union. Run with Heart Supporters are Crosspointe Dental and Orthodontics, Dentaleaf, Hughlett Chiropractic, Lifetime, Mansfield Chiropractic, and Snap Fitness. Media sponsor is Living Magazine and Fort Worth Star-Telegram. The event is facilitated by RunFAR Racing Services, Inc.